Photo taken a few years ago in our beloved Provincetown. Hair a bit longer and definitey more grey now. Same pajamas on this morning, as I stood on this same deck shortly after dawn, and then wrote this poem. Time reined in, schedules disappear. lazy etchings from past eddies. moorings draped in dripping sea grass. occasionally interrupted by a raucous gull. savoring the serenity of this place. I’m hosting Tuesday Poetics at dVerse today, the virtual pub for poets. Prompt word/s: rain, rein, and/or reign. Folks are invited to use one, two, or all three of these words. The one caveat is the poem must have a positive bent. Come join poets from across the globe — we’re a friendly bunch so would love to have you participate! Pub opens at 3PM Boston time. 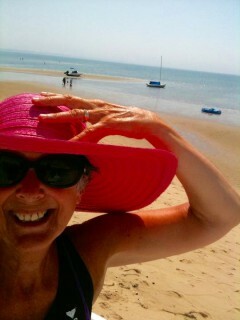 And yes, I’m in our beloved Provincetown, at the very tip of Cape Cod, Massachusetts. Two glorious weeks in this beautiful place. Photos from our deck. Feet are from a few years back…but others are from yesterday and today. It’s a special place in the off-season. as light begins to streak the sky. assured a new day has begun. Photos taken this morning at dawn. breaking through the silent calm of early morn. as sun glistened ripples lie mute in their beauty. altered by time, soaring above your land? Norman Mailer, Tennessee Williams, Eugene O’Neill. tumbled through years of artistic waves? an artists’ easel left for the day. Tony Kushner and Kurt Vonnegut. crooked arm of land surrounded by sea. Leave the ocean and stroll into her streets. hawkers outside beaded doors and lovers of every kind. Holding hands they strut, saunter, smile and wave. appreciate winter palettes of whites and greys. Oh Provincetown! Town of complexities. and wives who waited for husbands to return from sea. So many have claimed you. danced on your sands of time. More palettes of dawn and dusk. More ocean tides and raucous waves. More low tides that reveal your under life. I revel to return again and again. You hath cast your spell on me. Written for dVerse, the virtual pub for poets where today, I am hosting and asking folks to write a “travelogue” poem. Take us somewhere! Pub opens at 3 PM Boston (eastern) time. Provincetown is located at the extreme tip of Cape Cod in Massachusetts. In November 1620, pilgrims on the Mayflower landed in the west end of Provincetown and wrote the Mayflower Compact there, before journeying on and settling across the bay in Plymouth. The Governor of the Plymouth Colony purchased the land of Provincetown in 1654 from the Chief of the Nausets for 2 brass kettles, 6 coats, 12 hoes, 12 axes, 12 knives and a box (see wikipedia). Provincetown has been the summer home for many fringe and reknowned artists and writers. Twenty-seven year old Eugene O’Neill produced his first play here in 1916 and spent the next nine years of his life in Ptown. this ocean rolls within my soul. and imagine the call of your gulls. and savor the salt within your air. Dawn in Provincetown. Cape Cod, MA. so full of life and excitement. and stepped into your heart. And yet I saw nothing new. to feel your face upon my soul. and those that skirt your skies. You my love, care not. You seem to ignore what I crave. that we have been with you. Full moon over Provincetown. Cape Cod, MA. On July 20, 1969, I was 22, a graduate student at Bradley University in Peoria, Illinois. I’d heard about “the man in the moon” since I was a young child. You can “see” his face in the full moon, made by shadows and craters visible to the naked eye. On that July night at 9:56 PM, I watched my tiny portable television screen as Neil Armstrong stepped onto the surface of the moon. I remember staring in awe and then immediately running outside, standing on the sidewalk and looking up at the moon, as if I could see some sign up there! And I remember thinking: tonight there really is a “man in the moon.” Dverse opens at 3PM EST. Come join us!